Did you know I love turn signals? I do. I honestly do. It’s a weird fetish, and I can’t think of any four words least likely to get you laid than “I love turn signals,” but I don’t care. And boy do I have an incredible turn signal to tell you about today: it was so misguided and confusing the Ministry of Transport in Britain made them illegal. And they’re named for robots. Yes, my friends, let me introduce you to the Wilcot Robot, likely the only turn indication system that the British Ministry of Transport specifically refused to sanction. Even better than just being too confusing to be legal, the Wilcot Robot was born because William Morris, the man in charge of the Morris car company, was a cheapskate. 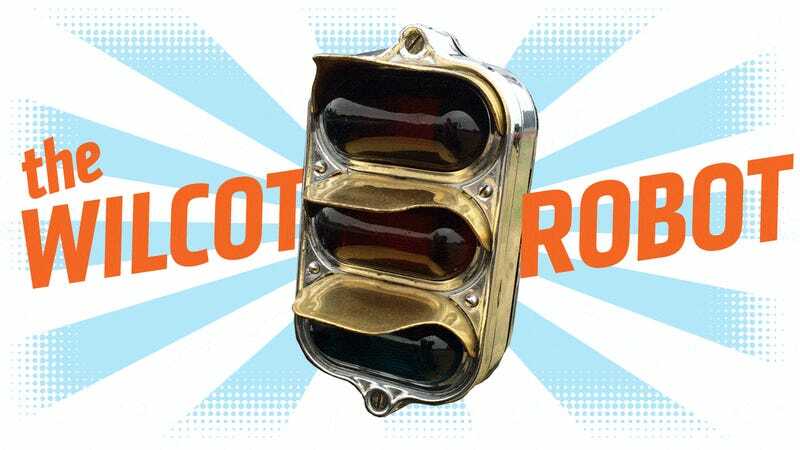 Here’s how this all came to be: back in the early 1930s, the turn indicator of choice was the ‘trafficator,’ or ‘semaphore’-style turn signals, charming little things that popped a little arm out of the side of the car to indicate the direction of the intended turn. These weren’t perfect, but worked well enough, and, more importantly, were sanctioned by the British Ministry of Transportation. Trafficators were also a German invention, and in the U.K. notorious magic-smoke-generating-equipment maker Lucas had the patent rights to produce these semaphore indicators, which would have meant that Morris would be required to pay a 2.5p royalty for every set they produced for their cars. Now, William Morris wasn’t going to piss away his money by giving Lucas some change for every car they made. Instead, Morris decided to piss away £50,000 (in today’s money, that’d be over three million pounds!) to develop the Wilcot Robot direction indicator. The Wilcot Robot resembled a pair of tiny, shinier traffic lights, with three stacked horizontal lights, in the same order as a common traffic light: red, yellow/amber, green. All Morris models in 1933 (except for the entry-level Minor) were fitted with Wilcot Robot indicators, two per car, mounted at the base of the A-pillars on long stalks, and with lenses on both sides so the indicators could be seen from the rear. As far as how these indicators worked, I’m not exactly clear, since there are conflicting reports. Everyone seems to agree that the green light lit up in the direction you wanted to turn, but what the other lights did is up for some debate. The other side was either lit red or red and amber, some say these two also flashed. I have also heard that when traveling straight ahead, the amber light showed both sides. So, if that’s true, then the amber lights seemed to indicate just straight motion, and the red indicated stop? So both ambers on is just normal driving, and the red was like an anti-turn signal, showing you the direction the car wouldn’t be turning? …various positions of the operating switch caused the colour lights to flash different combinations. For example, the driver wishing to turn left would show a green light to the off side and a red and amber would flash on the near side. This operating switch had a built in timed return to the off position. ‘Various’ positions of the switch? If it had more than LEFT and RIGHT, that’s a problem. ... a complicated signalling device such as that recently introduced by a certain make of car is a step in the right direction. While there may have been some competitive reasons for wanting to stymie Morris’ plans, it’s hard not to see his point. Once the Ministry of Transport made the Robot indicators illegal, Morris Motors offered to replace everyone’s Wilcot Robots with boring old trafficators for free. The Robot indicators pulled off the cars got basically the same treatment Atari gave for their huge, expensive failure, E.T., five decades later: they buried them in a big hole. A good number of Wilcot Robots survived, though, with a couple thousand being sold as novelties through local stores. Even better is that it’s reported that a set of the lights was bought from one of these stores by the brother of one of Morris Motors Ltd’s directors, and the brother tried to get Morris interested in using the goofy devices. I like to imagine the exaggerated eye-roll and long, drawn-out sigh that director must have given his brother. I’d love to see a set of these in use; so far I haven’t been able to turn up any videos. It seems that they occasionally pop up for sale, so I’d just like to suggest a set for anyone doing a restomod where they feel like they need just that little extra element of confusing mystery. Maybe I can talk the crew at ICON into re-making a few batches of these? Turn signals. They’re always fascinating! Another two-fisted tale of turn indication!